I LOVE to be outside. Rainy day or even sunny day, I need the fresh air. With a young baby (3 months old) I didn’t want er exposed completely to the outdoors unprotected and that when I found this gem! Perfect timing for summer. 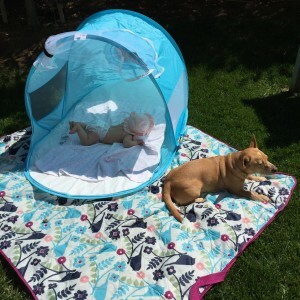 It’s carried at Buy Buy Baby and called the “Kids Sun Dome XL” by Kel Gear Inc. and I’m in love with it. Not only is it great protection from the sun and elements (sand if you take it to the beach), but it’s large enough I can lay in there with her and nurse her. It’s so lovely to lay outside listening to the birds for our midday nap time. I highly recommend. In addition, it has vents and a zip vented door to keep the bugs out. As well protects 50+ UPF. It’s just rad. ps. Doggies approve as well!